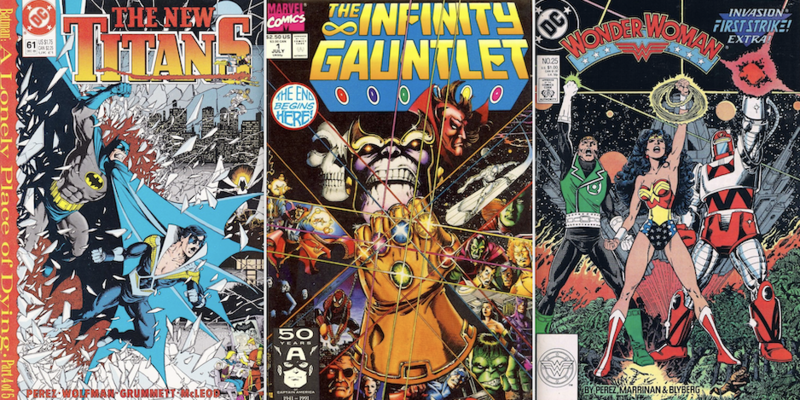 Artist George Perez produced an astonishing body of work over the last 40-plus years with extraordinary runs on The New Teen Titans, The Avengers and Wonder Woman, not to mention the landmark Crisis on Infinite Earths. But that’s only a fragment of his impact and influence. 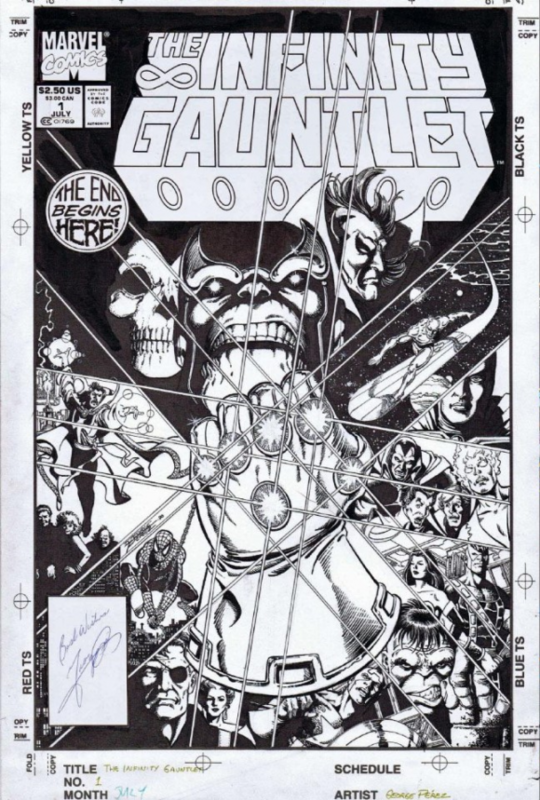 In addition to series like Justice League of America, JLA/Avengers, Action Comics, The Infinity Gauntlet and many others, Perez was also an ace cover artist. So, with Perez announcing his retirement this weekend (click here for the details), I asked some of comics’ top creators to pick their favorite covers – and why. The New Titans #61. Being the huge Nightwing fan that I was at the time, this cover really just hit all of those buttons for me. Dynamic, well drawn, graphically beautiful. Logan’s Run #1. The one thing a cover must do is sell the book. And this one by Perez did for me. 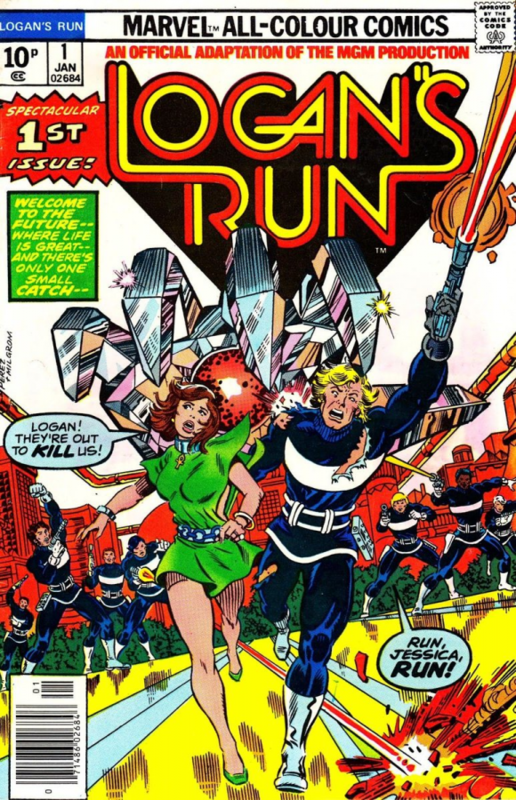 It was a hard sell without him doing it, too, since many things went against it in those days: chiefly, that Logan’s Run was a licensed property in no way tied to Marvel continuity (a big deal to this 15-year-old, for sure!). Yet this cover said something good was here, and not only did George do a great one, the art inside was spectacular as well. It’s where I discovered him, instantly becoming one of his many, many fans. In fact, I’m gonna cut this short and go dig these out and read them again! World’s Finest #1. 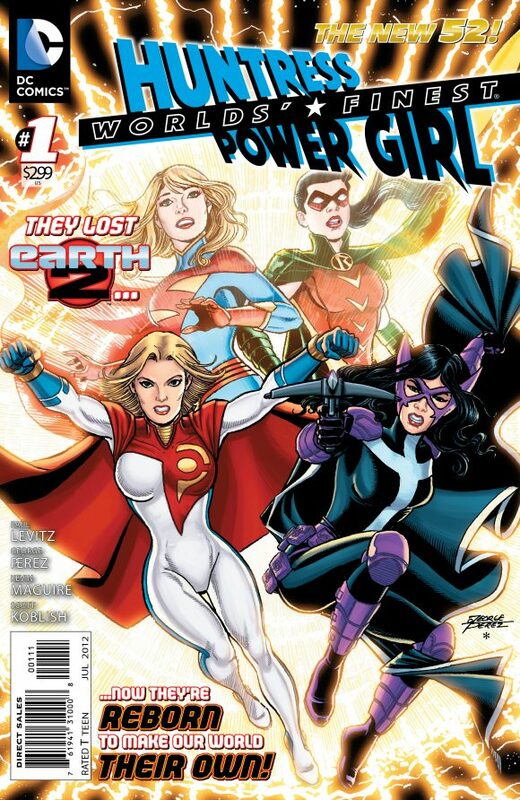 It’s selfish, but I’ll pick World’s Finest #1, George doing the cover for our collaboration on the Huntress and Power Girl. He may have done more amazing covers, but this was a moment we got to share. New Teen Titans #36, CrossGen Chronicles #2. 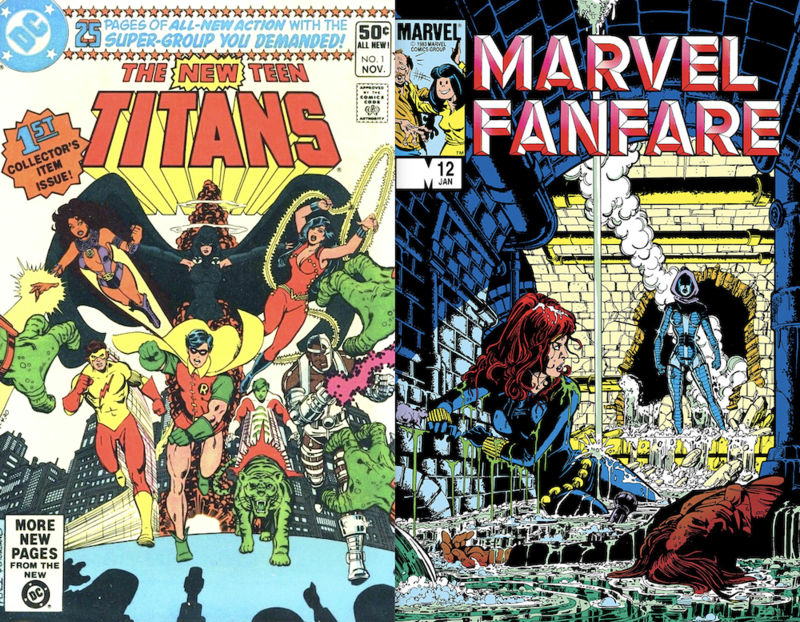 Picking one cover by George Perez would be almost impossible. So, I have to give you two. 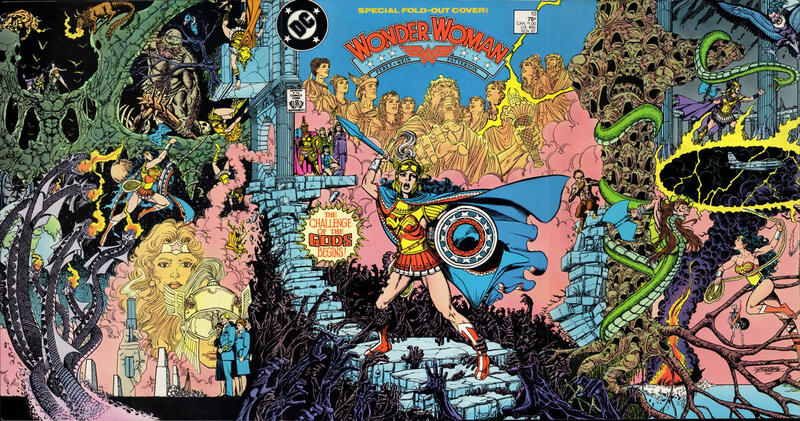 George Perez was the first artist I recognized as an individual when I was a kid, the first time it occurred to me that comics were drawn by people, and that I liked some artists better than others. This was during George’s first Avengers run, including classic stuff like The Korvac Saga. I became a much bigger comics fan, rather than a mere casual bystander, because of what George Perez did on those issues. Flash forward a few years to the end of high school, and I had fallen out of reading comics, discovering things like girls and cars. I was on my way to the beach (with a girl, in a car) and we stopped by a convenience store to pick up snacks for the day. 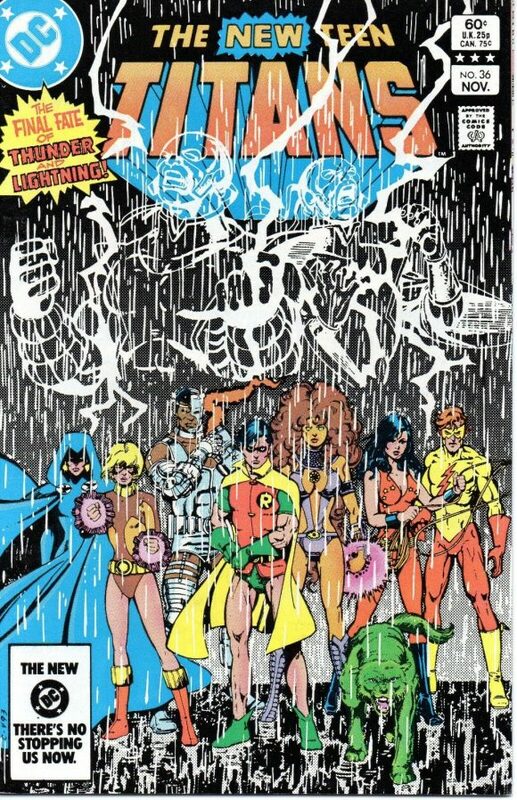 We passed the comic rack, and the cover of The New Teen Titans #36 beckoned to me, that great team shot with the rain pouring down. 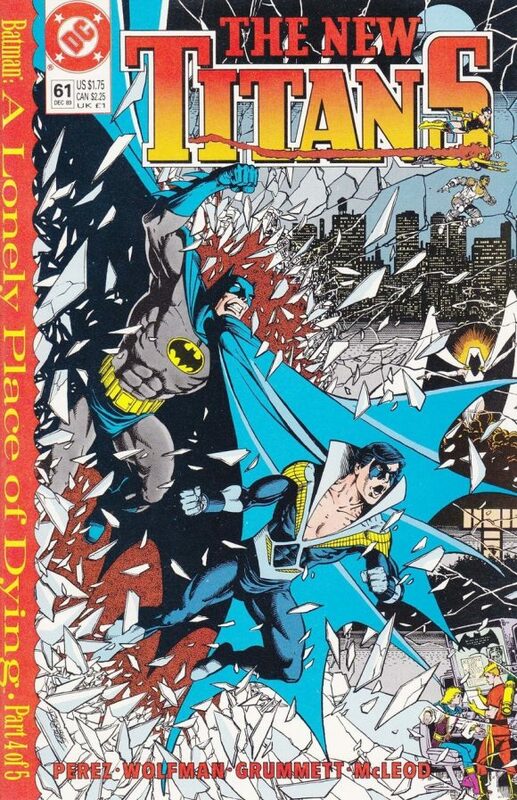 I was entranced by the art and the characters, not really having been a DC reader as a kid. I picked up that issue, jumping on the New Teen Titans bandwagon. 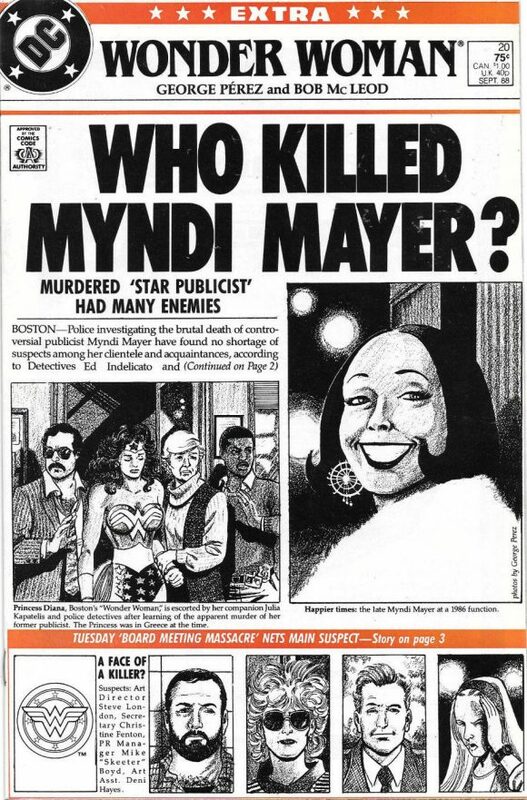 The irony, of course, is that George didn’t draw the interiors of that issue; it was a fill-in by Keith Pollard. A fine-looking job, but I needed my Perez fix, so I started hunting down other issues of Titans, and never looked back. 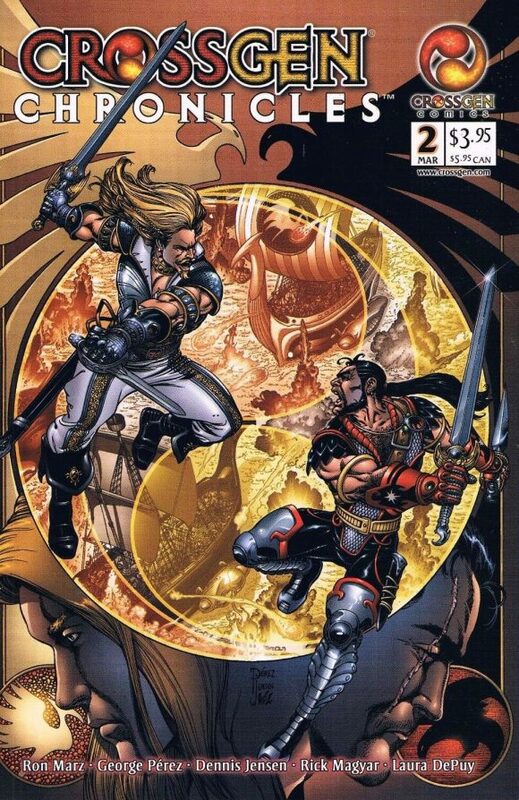 The other cover is a selfish one: CrossGen Chronicles #2, the first time I got to work with George. It was a real pinch-me moment, obviously. If I could go back in time and tell 10-year-old me that he’d get to work with George Perez one day, my head would’ve exploded. I did my best to write the story to George’s immense talent and storytelling sensibilities, scripting pages with a denser panel count and packed with detail. But, of course, George always upped the ante. If I wrote an eight-panel page, it came back with a dozen panels. With George, you always get more. More art, more characters, more detail, more personality, more kindness. Wonder Woman #20. I will say George has done more complex and action-oriented covers that are terrific, but this is the cover I thought of when asked to choose one. I recall very vividly when this issue came out, how striking it was compared against the other comics out that same month. I also loved this storyline in the comic, so I had some emotional investment in the character. Ultraforce #1. I’ll go outside the box and pick a cover that came at just the right time for me as a kid, introducing me to a new superhero universe I was excited to be one of the first fans of, with characters like Prime and Topaz that I instantly loved. 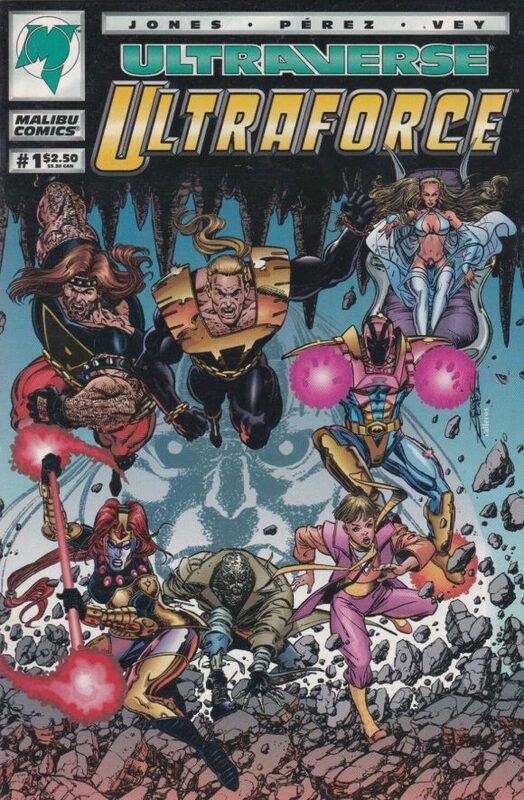 Malibu’s Ultraforce was a hit among even my casual comics friends, and the energy and freshness all began here for me. Logan’s Run #1, The Infinity Gauntlet #1, Wonder Woman #25. I have been a fan since I started collecting comics and the first work I remember where I fell in love with George is Logan’s Run. I met George at a show soon after and had him sign all my books and even got a sketch. This cover, like all his covers, show a story going on and not a single pin-up image. Al Milgrom was great on (cover) inks, but it was really Klaus Janson (inking the interiors) that made the package complete for me. 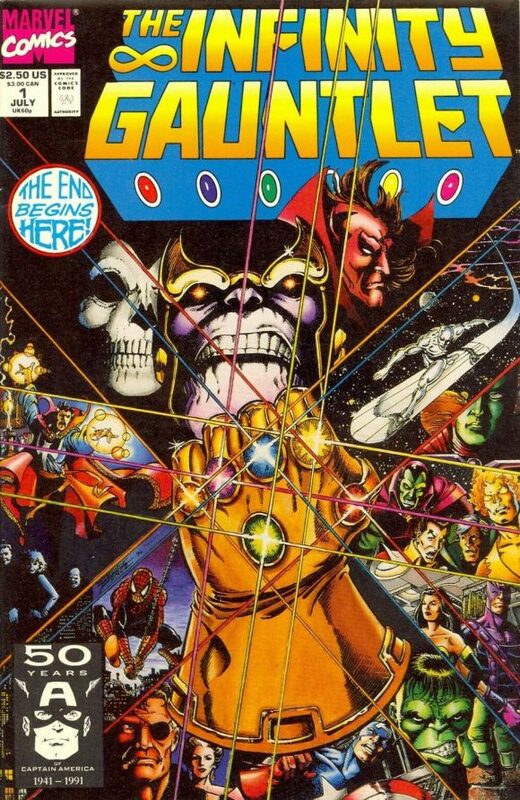 I also picked Infinity Gauntlet #1 because, again, a classic image, tells a giant world-shattering story and, to me, other than Starlin, George made cosmic look so damn cool. Last, I picked Wonder Woman #25, simply because this is the character I think he is best known to draw. I loved his run and attention to detail and you can see the research and amount of sweat on each and every page of his run. I love the man, his work and the great things he does for those around me. I wish him nothing but good health and happiness in his retirement. Fantastic Four #165. It’d be easy to pick a George Perez Crisis cover as a favorite; or New Teen Titans; or Wonder Woman; or JLA; or Avengers; or JLA/Avengers; and so on. 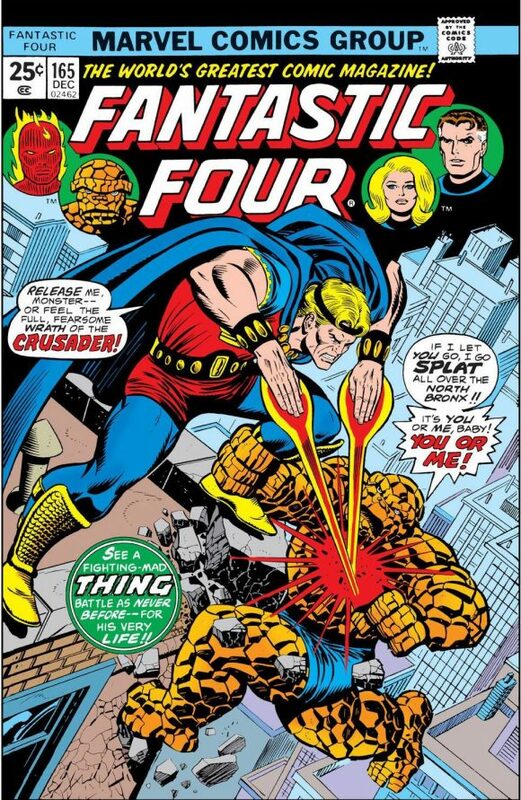 But rather than all of those dozens upon dozens of stand-outs, I picked this early FF issue as one that still looms large to me. Both Perez and Ron Wilson have been credited as the penciller of the cover with Joe Sinnott as the inker. Either way, Perez and Sinnott did the interior art and it was one of the very first comics I ever read. Even then, before I knew artists’ names or styles, the power, detail and skill in George’s work rose above the rest. So, this one remains a favorite, but so do dozens of others. George will always be one of my favorites, and I thank him for such a lifetime of great work and beautiful, impactful contributions to comics. I hope he has a long, relaxing and enjoyable retirement. The New Teen Titans #1, Marvel Fanfare #12, Wonder Woman #10. My first introduction to his work was The New Teen Titans and the intricate detail of his work won me over from Day One. The Marvel Fanfare books featuring Black Widow made me a Black Widow fan but the stand-out piece of work from the master of detail was his run on Wonder Woman. 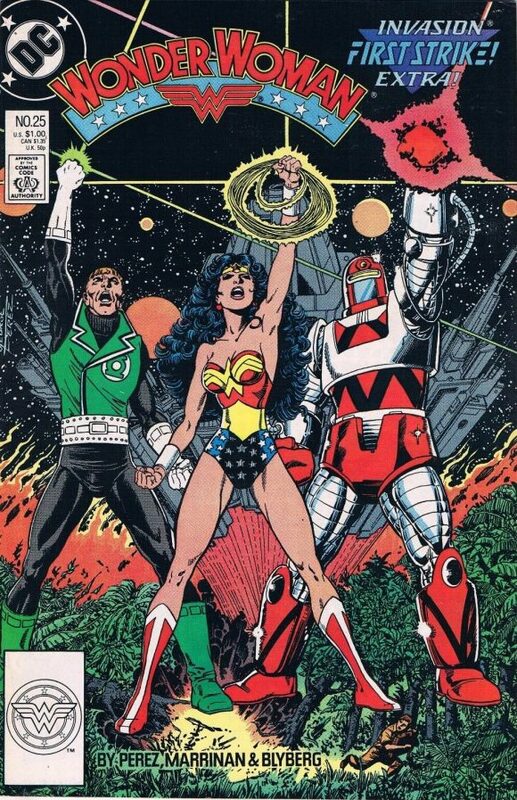 Lynda Carter might have introduced me to Wonder Woman as a kid but George Perez made me love her. Issue 10’s wraparound is pure artistic genius. 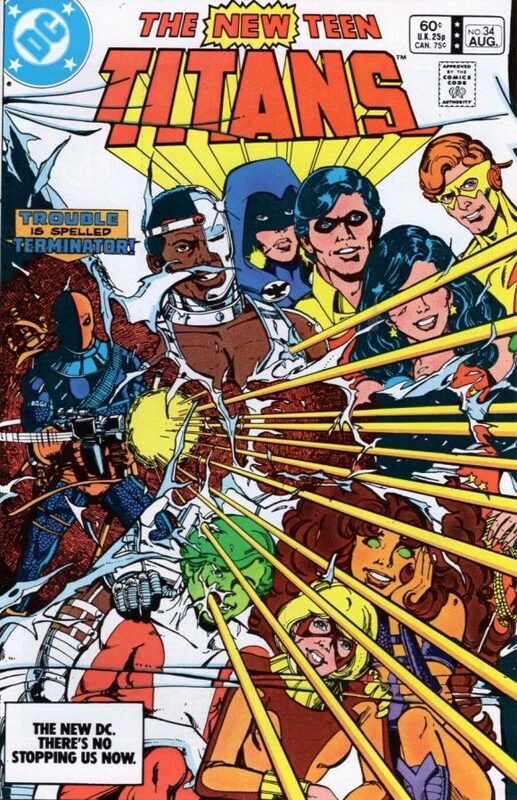 The New Teen Titans #1 inked by Giordano. True Story: When I was recovering from a serious knee injury I gave my entire George Perez WW run to my friend Louisa Mariconda as a present for helping me through that time. Enjoy your retirement, Big guy! The New Teen Titans #34. George Perez is known for his impeccable detail and draftsmanship, but his design sense is often unheralded. To that end, one of my favorite Perez covers is The New Teen Titans #34. How many different ways can you depict a villain threatening the team? The maestro found a new one here — with the dangerous Deathstroke shooting up the Titans’ very own cover! Bold, eye-catching and tells the story so well in a single image. A clever idea, excellently (ahem) executed. — GEORGE PEREZ Formally Retires From Comics. Click here. — MARV WOLFMAN on the Creation of THE NEW TEEN TITANS. Click here. Mr. Perez truly was a fantastic artist in his own right. This post is a great sendoff for him. There are so many great covers George did but the best cover George Perez ever did is “Crisis on Infinite Earths” #7. Arguably, I’d say it’s the best cover period. Superman holding the body of his cousin while all the gathered heroes look on in sadness was so powerful. The anguish Superman was experiencing was heart-wrenching.